The latest release on Stellar Fountain welcomes Ri Za back to the label for a brand new single. The Slovakian artist last appeared on the Hungarian imprint in May of 2015 with his ‘Everything Behind Us’ EP. Over the last year Ri Za has added Alola Records and SexOnWax to his discography and also records under the new alias Just Hear. 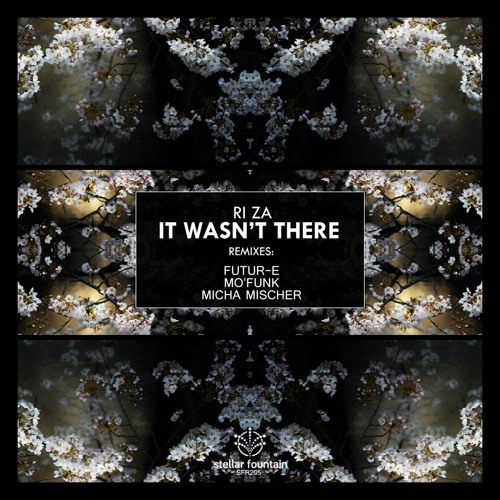 Ri Za’s new single for Stellar Fountain is entitled ‘It Wasn’t There’ and includes remixes from Futur-E, Micha Mischer and Mo’ Funk. The release begins with the original mix and finds Ri Za with a tough minded progressive techno approach. Clusters of bass stabs make up a rugged foundation while buzzy synths further enhance the groove. Wonky rhythms and clattering drums slowly build up around the framework before a wave of modulation initiates the main break. Short but deadly, it builds to a tense moment before a massive drop reveals the buzzy groove once more for a big moment. A monster tune from Ri Za. Next up Micha Mischer makes his label debut following past releases on Electronic Tree and Proton’s Particles. The German artist keeps the up-tempo nature of the piece but with a much deeper sensibility attached to it. Anchored by a spacious framework, the beats and rhythmic elements breathe incredibly well. An overlay of warm pads and spaced out sweeps bring several subtle but gorgeous moments while a lone cluster of keys sits as perhaps the track’s most prominent element. Gorgeous remix from Micha. Closing the release out is Mo’ Funk who is making his first appearance on Stellar Fountain following a onetime outing on their Deep division. The Croatian artist is best known for many releases on Balkan Connection’s Tech division and also has close ties with Clinique, Electronic Tree and The Purr. Here he brings his brand of melodic tech house to ‘It Wasn’t There’ with great results. A wealth of vibrant stabs, smooth rhythmic elements and a wickedly shaped groove are the star of the show, while a soft ambiance creeps in for some brief moments of beauty. A great remix from Mo’ Funk which closes out another release full of nice variety and good music from Stellar Fountain. Don’t miss it.